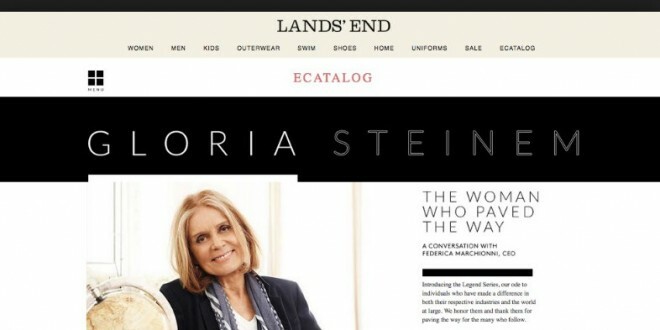 Lands' End Apologizes To Right Wingers After Publishing Gloria Steinem Interview In Latest Catalog - Joe.My.God. Lands’ End quickly backpedaled this week from an association with feminist Gloria Steinem after hearing complaints from customers and the publication of an article by a pro-life news agency. With customers taking to the company’s Facebook page to voice objections centered on Steinem’s support for abortion rights, Lands’ End on Tuesday removed a feature on Steinem from its website. Company CEO Federica Marchionni had interviewed Steinem to kick off the Lands’ End “Legend Series” on “individuals who have made a difference in both their respective industries and the world at large.” On Wednesday afternoon, the Dodgeville-based retailer of traditional clothing issued an apology. “We understand that some of our customers were offended by the inclusion of an interview in a recent catalog with Gloria Steinem on her quest for women’s equality,” the firm said in a statement. “We thought it was a good idea and we heard from our customers that, for different reasons, it wasn’t. For that, we sincerely apologize.